We’re reimagining scones to bring you remarkable sweet and savories that you can feel good about eating. All of our scones are handcrafted in small batches, freshly baked and hand delivered. With an emphasis on all natural, organic ingredients, our entire menu is free of refined sugar and soy. We offer a wide range of flavors, with many vegan, gluten-free and nut-free options, ensuring a scone for everyone. Orders can be placed at least 48hrs in advance and we will deliver for your special event, meeting or gift. With delectables such as Snorker, Suzy Sunshine and Ursa Major, our scones are named after dear friends and family, inspired by special times throughout the years. From our Sconely community to yours, let’s scone up together! Sconely is partnering with the non-profit Community Healing Gardens to support the urban farming movement in LA. 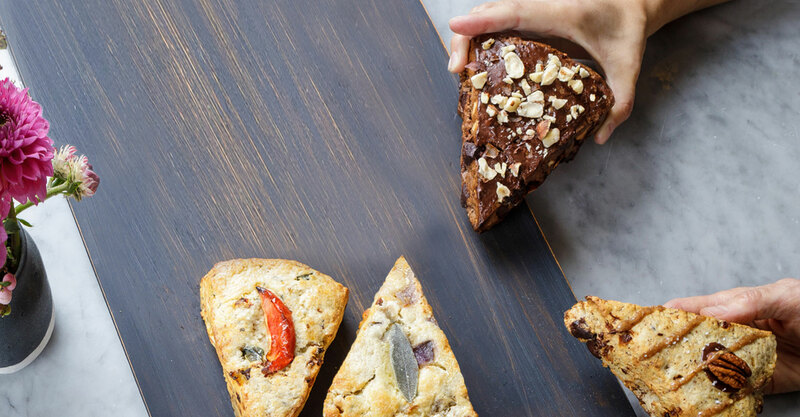 For every dozen scones you purchase, Sconely donates 1% to Community Healing Gardens, to plant and share healthy food in diverse and underserved communities in LA.